THE SPOTTED HARE: Simple Christmas Traditions . . . . Simple Christmas Traditions . . . . The layout of our home really doesn't really allow for a big tree. In lieu of that we have 3 (or more) smaller trees nestled in antique crocks. 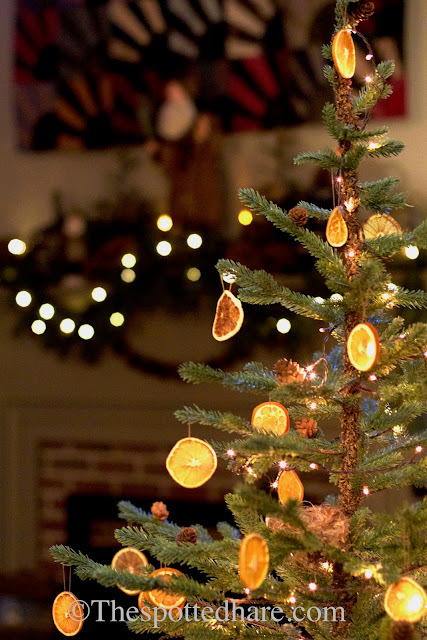 Each is simply decorated with lights, pinecones and dried orange slices. I find it quite calming in a season that can be anything but. I make a new batch of these pretty slices each year. and might not "glow" as much, they are still pretty. Don't they look lovely nestled into this antique bowl? If you'd like to make your own, just follow the directions below. Set your oven to 200 -225 degrees. Line cookie trays with parchment paper. 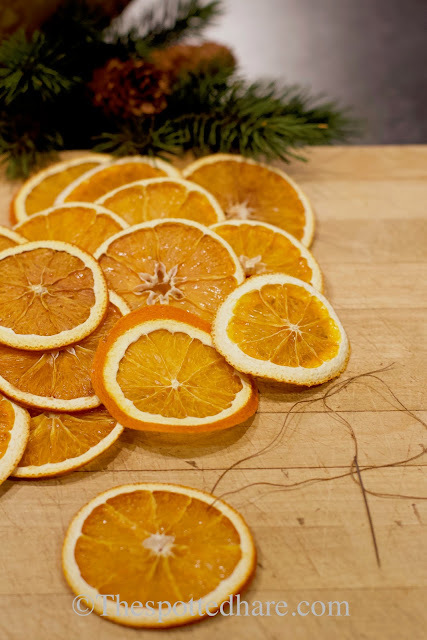 Slice navel oranges into about 1/8" -3/16" slices. 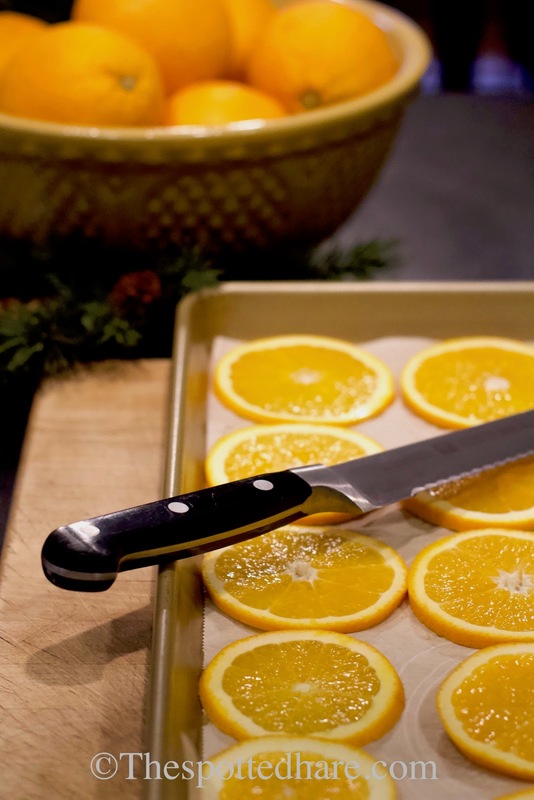 Lay orange slices in a single layer on cookie sheets and put into oven. After about 45 min to an hour turn them over. Check them about every 20-30 minutes and turn each time. Keep a close eye once they are close to done as they can brown quickly. String with a needle and strong thread. THANK YOU for this refresher ... mine are old and we need to replace them. Wishing Merry Christmas Tidings to you and yours. Thank you. I am going to make a batch for myself. Soooo beautiful! Thank you for sharing. 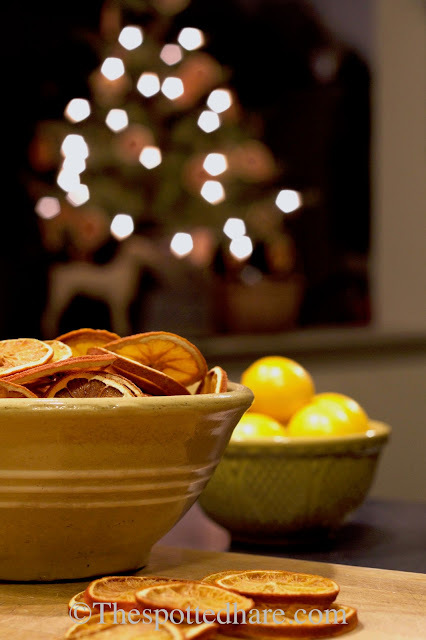 Maybe someday I'll make some of the orange slices and decorate a tree. It's so simple here that we don't decorate at all most years! Merry Christmas to you and yours! My orange slices always get too dark. But I use them anyway. :-) I will try your recipe this year, instead. I love your first photo...such a lovely country tree, and with the soft focus Santa in the background. Just beautiful. Thank You for sharing Lori.